Saturday 16 February at 7:30pm, St Saviour’s Church, St Albans. Sergei Rachmaninoff: The Liturgy of St John Chrysostom. 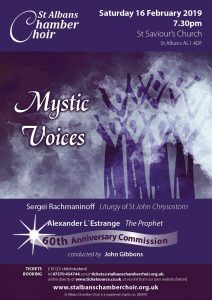 Sergei Rachmaninoff’s first choral masterpiece, The Liturgy of St John Chrysostom, is a setting of the texts of the Eastern Orthodox Eucharist service. It is named after John of Antioch, a fifth-century Archbishop of Constantinople, who was famous for his inspirational sermons (Chrysostom means golden-mouthed). Rachmaninoff composed it in a burst of inspiration in just three weeks. He wrote ‘Not for a long time have I written anything with such pleasure’. After its premiere in Moscow in 1910, the ecclesiastical authorities refused to sanction it for use in church services and when Rachmaninoff fled into exile after the Russian revolution, the work fell into obscurity. A chance discovery of part books in a monastery in Pennsylvania led to its being republished in 1988 and this glorious piece has now become an established part of the Russian liturgical repertoire. For the choir’s sixtieth-anniversary commission, local composer Alexander L’Estrange has set three texts from Lebanese-American writer Kahlil Gibran’s book of inspirational poems, The Prophet, published in 1923. The book contains chapters on a number of subjects including joy and sorrow, freedom, work, reason and passion, pain, self-knowledge, teaching and friendship, and from these Alexander has selected the sections on marriage, children and death and set them for a cappella double choir.